The Ludington Skate Plaza, which opened in 2008 during the July 4th weekend, is just another example of how the Ludington community bands together for a worthy cause. 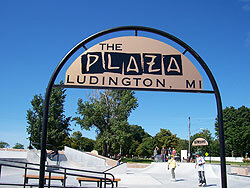 Located at Stearns Park right next to the Ludington Area Jaycees Mini Golf Course, the Skate Plaza was made possible by corporate, state, and private donations. It's impressive by its size plus its combination of bowls, rails, quarter pipes, and ramps. It's proven to be a very popular venue for kids with skateboards and in-line skates, but the number of people who come to watch is just as large. It's a whole new form of entertainment for people of all ages. Stearns Park has become the focal point of Ludington. The beautiful, clean beach, wide breakwall and North Breakwater Light have always been a big attraction, but now there's so much more. You can play a game of volleyball, mini golf, or shuffleboard, with food concessions and restrooms at the north and south ends of the beach. Kids enjoy the adjacent playground, and the grassy, shady area with grills makes a nice picnic spot. Now with the addition of the Skate Plaza, Stearns Park is definitely the place to be during our glorious summer months.